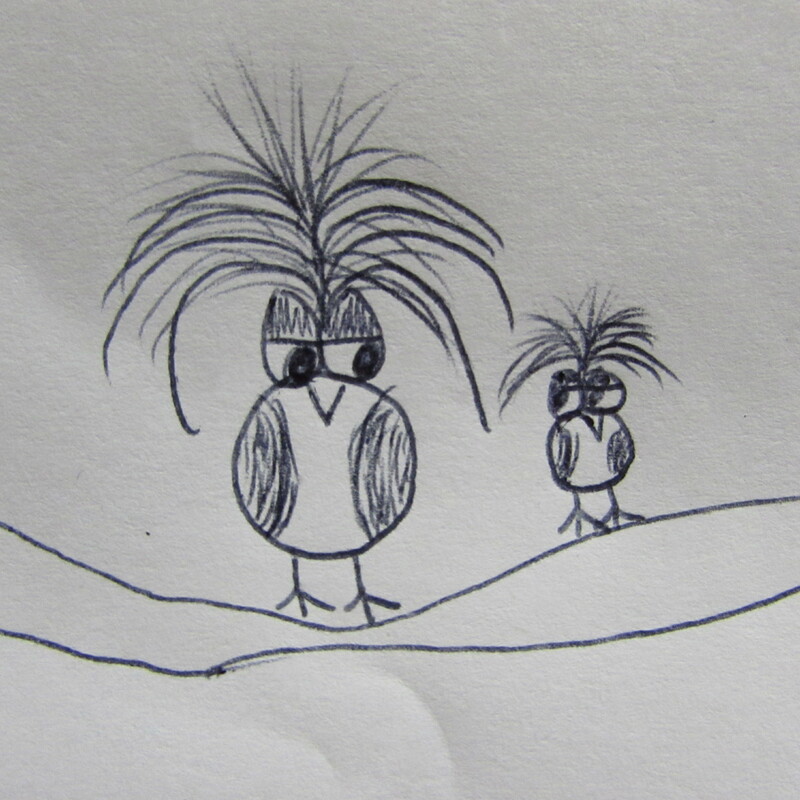 I have a family chock-full of fine artists. They can sketch, draw, paint, watercolor and make any canvas a thing of beauty. Then you have me. I am really good at raising chickens, I cook a mean pie and am unintentionally funny (I run into things and fall down a lot). I took art once. I was supposed to draw a raccoon in pencil. I drew something. It did not look like a raccoon. I’ve been drawing this bird since I was 10. He hasn’t changed in 22 years. Hey, at least I’m consistent. 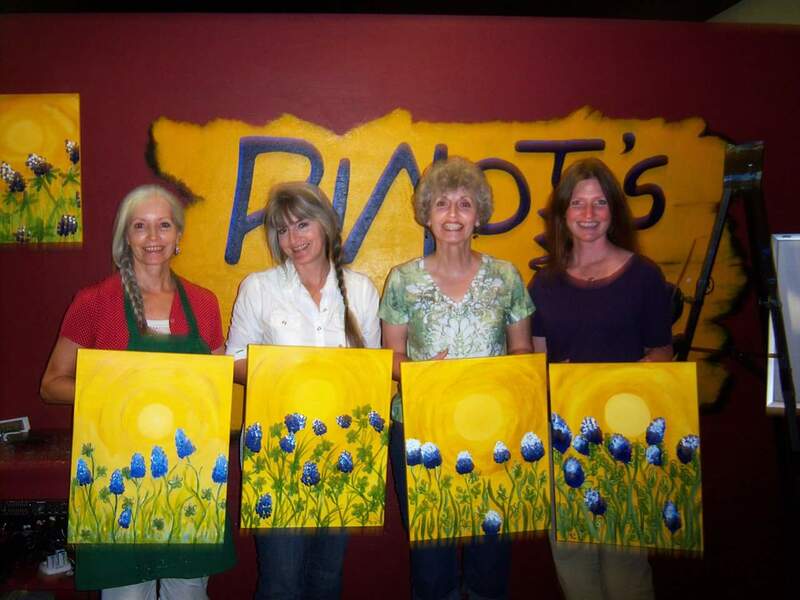 Then I went to a painting class with my mom and aunties. I painted some blue bonnets that looked an awful lot like oven mitts from a convenience store gift shop. From the left ~ Aunt Sherry, My Mama, Aunt Mel and Me. Note the ‘mitt-like’ quality of my blooms on stalks much to thick and tall, reaching to a sun that is much too defined. I tried again and it was so bad I refuse to post a picture here. Yet, I still enjoyed the art of it even though my results were less than desirable. Determined to give it another go, I called up my sister and we made a painting date. So Sunday afternoon she came over, tiny canvases, paints and brushes in tow and we created together. She a wren, I an owl. The owl was from a photo I found in an old book, it was some kind of a burrowing owl peeking over a mound of dirt. Now, my painting looks NOTHING like the picture but I have to admit, I kinda like the little fellow. I have found a new hobby. I guess I finally realized that even if my pictures are horrid compared to others in my family, they aren’t half bad for me. Paint on people, paint on! Totally off-the-wall random thought. 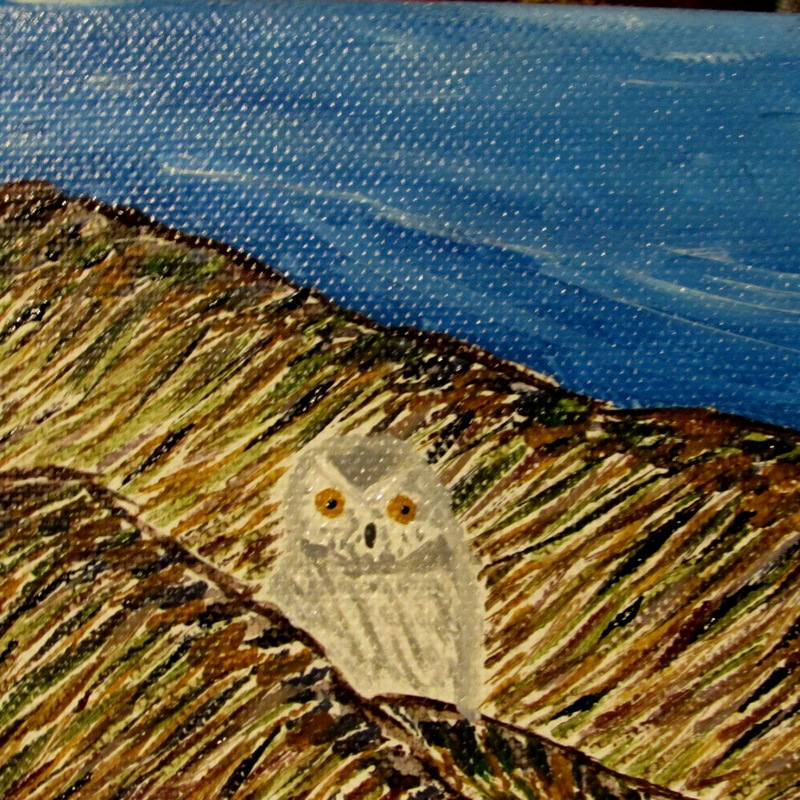 Is it not odd that I, The Chicken herself, chose to paint an owl? Yes, that is very odd. No ‘real’ chicken would ever consider this. Much less share it with anyone. I’ll make it up to them and attempt a Stripe-Stripe portrait next……. You’re a “hoot”! Paint on! Keep it up! And, I think you are being way too hard on yourself about those blue bonnets and the sun. Like passing out in your chair will ensure a steady hand, right? Hahaha! 🙂 Aren’t we funny? I tend to chew my lip when I’m concentrating, which is why I pretty much always wear lipstick. If I know there’s something on my lips, I’m less likely to chew them. Or to concentrate, for that matter…. LOL!